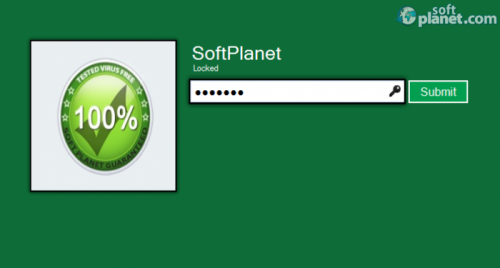 SoftPlanet makes it possible for everyone to get free WinLockPro download directly from our servers. There is no registration needed for downloading. Security is one of the most important things today. Protecting your valuable information from being stolen is too. WinLockPro V.13 is a small-sized and free-to-download application that can bring stronger protection to your information and more colors to your life. This program can lock your desktop screen with a password for the moments when you are away from your desk. 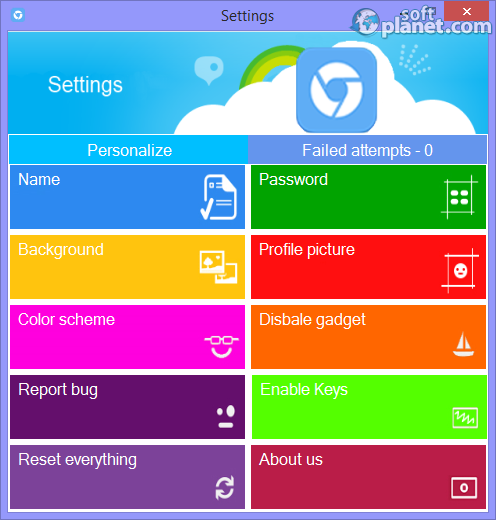 It is very configurable and any user with a sense of colors will like it. 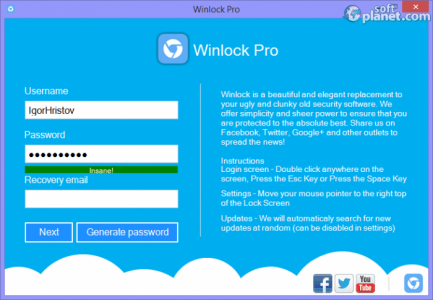 WinLockPro may not look as a serious product, but in fact it is. You can customize just about anything that the program deals with starting with the profile name, picture and password to the color scheme, background image and leaving a note message. This app is free of charge and can be downloaded to any computer running Windows XP, Vista, 7 or 8. When installed WinLockPro will add a small gadget icon in your upper right corner. It can be relocated anywhere on your screen if you want to. It has three buttons – Update, Settings and Close. The Settings button opens a very colorful window where any user can personalize the program properties to its own vision. One of the good things users can do is create a custom profile with a unique name, password, background, profile picture and color scheme. Once you create your account with WinLockPro you can change it at any other time. However, this process requires a program restart in order for the latest changes to take effect. There is a Reset Everything button which brings back the program default settings. A single click over the application icon activates the protection and then you can double-click on your desktop or press the Esc key to visualize the password field. Once that is done you are back to your normal PC state. In the end we can only say good words about WinLockPro V.13. During our test the program did not stop responding or crash at any time. This utility is one of the prettiest ones that bring strong protection and many colors to your life at the same time. Our security scan shows that WinLockPro is clean from viruses. The current version of WinLockPro has been scanned by our system, which contains 46 different anti-virus algorithms. That ensures that WinLockPro V.13 is 100% safe for your computer.